Vanish Gold is super-boosted and fast-acting. From the ones you can clearly see to the tougher ones that may be hidden deep in the fabric, providing astonishing results in as little as 30 seconds. 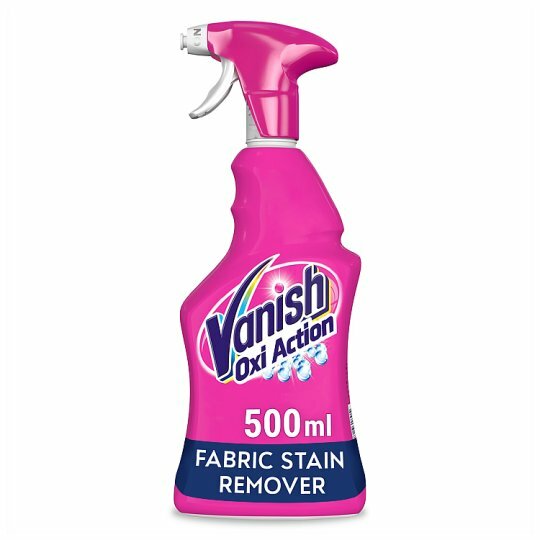 You choose how to use this versatile stain remover spray; in wash, pre-treat or to soak your fabrics. Do not use on wool, silk, leather, finished or coated surfaces - for example wood and metal. For best results treat the stain as soon as possible and apply on both sides. Spray directly onto tough stains! Always follow washing instructions on garment or fabric care label. Safe on colours & whites when used in accordance with manufacturer's instructions. Check for colour fastness by testing the product on an inconspicuous or hidden area of the fabric. Rinse and allow to dry. Do not use on wool, silk or leather. Do not spray the product on fabrics with metal fasteners, and/or flame resistant finishes. Do not use on garments recommended for dry-clean only. Do not leave the product to dry on the garment (maximum 5 minutes contact time).